Measurements: 2.65 x 3.8 inches, or, 67 x 97 mm. A trifle small. Back of card: A rich, solid green (similar to Harrods green), with a thin gold border. In the center, a Celtic cross, set in an ornate circle. These may be inverted. Book included: Yes, 120 pages, hardcover. Dimensions: 5.15 x 7.2 inches, or 13 x 18.4 cm. Illustrated. Publisher: St. Martin's. Printed in Singapore, post-production in China. Comments: This comes in a nice wood box, but the first box we got was broken in transit, so don't go throwing this around. I should also note the labels stuck on the outside of the box come off much too easily. Also in the box is a pad of paper, about 50 sheets, 3.45 x 5.25 inches, or 88 x 134 mm intended to record readings with this deck. There is also a single, large record sheet with room for all kinds of notes. Instructions on the sheet are to make copies & use them. This is your life, as told by 25 trees & brambles native to Ireland. 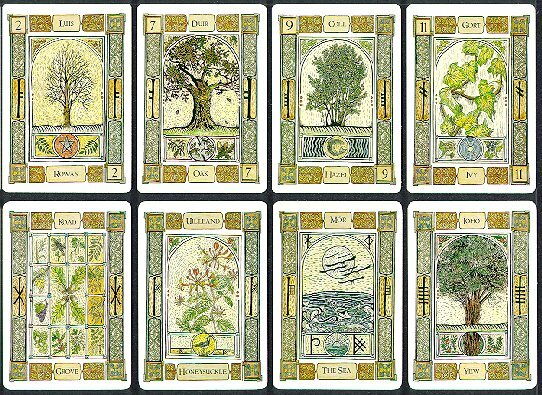 More interesting than the tree of the day are the notes on the ancient, secret, Celtic/Druid alphabet, which can be seen on the left & right side of each card, in the 9 o'clock & 3 o'clock positions. Each of these 25 letters relates to one of the trees of the deck, and perhaps to much else in Celtic lore as well. Their casual similarity to Runes may not be accidental. This alphabet & its correspondances to the English alphabet, tree, month, keyword & page in the book, are given in the endpapers of the book, a useful aid. Each card has two pages in the book. The title of the page/title of the card, is given both in Gaelic (so I presume) and English. There are extensive notes on reading the cards, case histories, and appendices with more on the tree alpahbet, the Celtic calendar & references for further information.